A Pair of Thatched Animals: Rooks or Ravens? 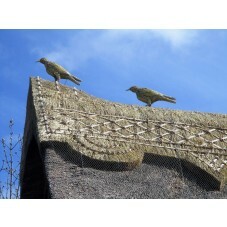 Saffron Walden Sweeps Uncategorized A Pair of Thatched Animals: Rooks or Ravens? Well I thought it was time for some more thatched animals and how apposite this photo is of two arch chimney blockers. The curse of every home owner and chimney sweep, members of the crow family. I think that these two looks like Ravens, although they could just as likely be crows or Rooks? It is getting towards that time of year where members of the crow family (Latin name: Corvidae), start thinking about nest building. At this time a nice warm chimney provides a tempting base to build a nest. They do this by continually posting twigs and any other suitable material they can find down the chimney, until it can completely block the whole flue and present a stable platform for the nest at the top. A lot of effort is then required from the sweep to remove the nest from the chimney, and not whilst the birds are nesting. So a strange choice to have as thatched animals on any chimney? I’m thinking that these two are Ravens and put me in mind of Odin the chief Norse god and his two Ravens Huginn and Muninn. In old Norse they are: Huginn (thought), and Muninn (memory). Both birds reportedly fly all over the world, Midgard, and bring information to the god Odin. Huginn and Muninn are attested in the Poetic Edda, compiled in the 13th century from earlier traditional sources: the Prose Edda and Heimskringla, written in the 13th century by Snorri Sturluson; in the Third Grammatical Treatise, compiled in the 13th century by Óláfr Þórðarson; and in the poetry of skalds. The names of the ravens are sometimes modernly anglicized as Hugin and Munin. In the Poetic Edda, a disguised Odin expresses that he fears that they may not return from their daily flights. The Prose Edda explains that Odin is referred to as “raven-god” due to his association with Huginn and Muninn. In the Prose Edda and the Third Grammatical Treatise, the two ravens are described as perching on Odin’s shoulders. Heimskringla details that Odin gave Huginn and Muninn the ability to speak. Migration Period golden bracteates, Vendel era helmet plates, a pair of identical Germanic Iron Age bird-shaped brooches, Viking Age objects depicting a moustached man wearing a helmet, and a portion of the 10th or 11th century Thorwald’s Cross may depict Odin with one of the ravens. Huginn and Muninn’s role as Odin’s messengers has been linked to shamanic practices, the Norse raven banner, general raven symbolism among the Germanic peoples, and the Norse concepts of the fylgja and the hamingja.